Timber Ridge Church’s congregation is 50 percent college students. Photo courtesy of Timber Ridge Church’s Facebook. College is a time of transition. Students leave home for the first time and try to find where they “fit”. Many people find where they belong in Greek life and others find their home in the 51 various organizations at Tarleton State University. For some, they find their home in college ministry. This was the case for Nic Burleson, the pastor at Timber Ridge Church in Stephenville. Growing up, Burleson wanted to be a football coach. Between his junior and senior years of high school, he began getting serious about following Jesus and praying about his future. “I felt that, not that coaching would not have an incredible career, but that maybe God was calling me to do youth ministry. So I did an internship at church as a youth intern and fell in love with working in the church,” said Burleson. Becoming a pastor became a by-product of working in the church. Moving to Stephenville was an opportunity to do something different, to reach young adults especially with Tarleton being here. “Everyone told us not to move to Stephenville, that we would be committing career suicide because this town is too small,” Burleson said. Timber Ridge started in September 2011 with Burleson, his wife, their 22-month-old son and one other college couple, meeting in Burleson’s living room. Now on a regular week Timber Ridge welcomes around 1,800 people, during five services a week. Timber Ridge has grown a lot in seven years. Their congregation is around 50 percent college students and the other 50 percent is from the rest of the Stephenville community, making Timber Ridge heavily populated by college students between the ages of 18-26. Timber Ridge’s population is about half the average age of adult churchgoers in the United States. “We are strategically focused on reaching young adults, students and young families. We celebrate that as an accomplishment, this is our goal and our vision, it’s not just an idea, it’s becoming a reality and it’s incredible,” said Burleson. Since first opening its doors in fall 2011, Timber Ridge has seen tremendous growth. Their first location was a run-down hotel in Stephenville that seated about 200 people in the ballroom and held its children’s ministry in the hotel’s old bar. Their next facility was gifted to them by an older church that was struggling to stay open. The church continued to grow to point that they decided to build a larger facility to expand their worship center. Timber Ridge’s vision is “Love God, Love People and Change our world”. “Our foundation is that we want to help people have a real relationship, where they love God and know they’re loved by God,” said Burleson. One goal is to be able to reach the younger generation in a way that is natural for them. Typically, the younger generation is happy with the way things are done at Timber Ridge and have given positive feedback. “People come because they feel a sense of belonging before even becoming a Christian. It’s been really cool to see ministry in a different way than I ever thought ministry was,” said Youth and Worship Pastor Michael Pittman. 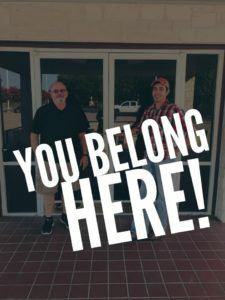 Timber Ridge recognizes that the church is not for everyone, but the church leaders are happy to help anyone find a church that fits them. Burleson feels that there is something special about Timber Ridge that keep people coming back and calling Timber Ridge their home. “Before I got connected, I felt like I had no one in Stephenville. I felt like I was alone, after learning who Jesus is and accepting him in my heart at Timber Ridge, I knew I found my home,” said senior, Jaime Potter. The staff and volunteers at TROC (Timber Ridge On Campus) their college ministry, are made up of many current college students who care about reaching their peers and making Timber Ridge feel welcoming to everyone who walks through its doors. Timber Ridge may have grown quickly, but the church still has big dreams and goals it plans to achieve. The church leaders work hard at leadership development and want to develop people to help them become leaders. “We have big dreams that we can’t accomplish without big teams, and it’s all about leadership development,” said Burleson. Timber Ridge Church has four services on Sundays: 9:30 a.m., 10:45 a.m., noon and 6 p.m. Timber Ridge continues to grow. On Sunday, Nov. 4, Burleson announced that Timber Ridge would be expanding and building a brand new facility. If you are unsure about church but want to try it, Timber Ridge might be your new home. “It’s a very welcoming and safe atmosphere,” Burleson said. Timber Ridge wants to help you find your church home even if it’s not with them. Timber Ridge offers four identical services on Sunday’s at 9:30 a.m., 10:45 a.m., noon and at 6 p.m. as well as children’s ministries. 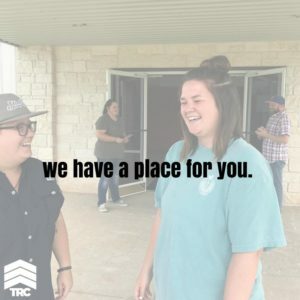 On Wednesday nights TROC, the college ministry, from 9 p.m. to 10 p.m. also host many special events for young adults. Timber Ridge offers life groups, or Bible studies, that are held Sunday-Friday nights. To find a life group and learn more about the ministry, visit their website at TimberRidgeChurch.com.